Make or Break: What Happens When Kanban Fails? What happens when things start to go astray? When the adoption starts to show signs of failure? Earlier in my previous post, we’ve talked about ways our Content Management Team at Titansoft uses Kanban to improve our team’s performance. Like all learning journeys, our Kanban one was definitely not all smooth-sailing. We’ve learned many things along the way, what worked for us and what didn’t. Whenever teams adopt new systems, it’s easy to fall prey into a “we’re good from here” mindset. How can you know when the team starts to show signs of Kanban weariness? In this post, I’ll share some observations and lessons-learnt on where and how Kanban didn’t really work for us, and ways we’ve tried to work out those issues. We had no problems at the start getting the team to be fully on board and involved in the board. But as time goes on, it’s not too long before we started observing teams not keeping the board updated. Items went into implementation without being pulled into the board and somehow moved right to the “Done” column. This is problematic because the board no longer serves its purpose of visualising processes and bottlenecks. How can we use the Kanban board to pool resources together to remove the bottleneck and stop members from pulling in new items if the board no longer reflects reality? An often outdated board can be dangerous and is a signal that members are not finding the board useful enough to help them stay on focus. Make it a point to highlight and address the issue right away to the members whenever such cases occur. I’ve also found it useful to introduce avatars to the board as a running indicator of status and capacity. When avatars are ‘parked’ somewhere outside of the board, we can use it as a cue to question if they are facing obstacles moving on in their work. The question we always ask: why set rules when they are going to be broken anyway? It’s simple. Because we have to first learn and master the rules of the game before we can break them. When WIP limits are not taken seriously, we are simply disregarding one key objective of adopting Kanban: to prevent overload or waste. Disregard your limits? You are disregarding improvements as well. Undervaluing your WIP limits means missing out opportunities to highlight team’s bottlenecks and obstacles in the team’s process due to lack of focus, people, or skill sets. One common approach to continuous improvement is to reduce WIP limits when the team reaches stability with an existing capacity. Keep in mind that it’s easy to grow comfortable with your original WIP limits. You really shouldn’t. WIP limits are meant to be adjusted. Lowering the limits will expose new obstacles, new bottlenecks and problems until we resolve them and get the flow working again. 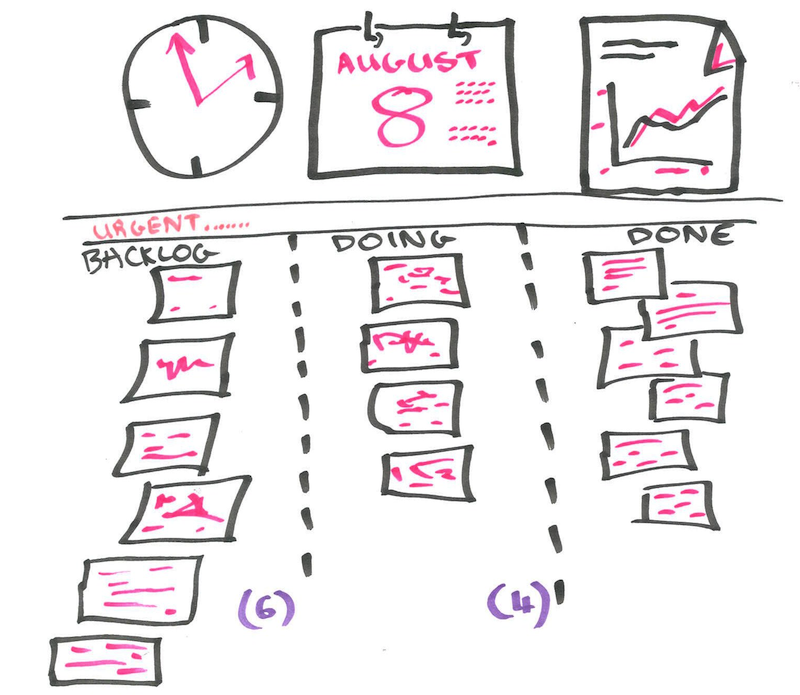 A good Kanban board can help to get you to the right WIP limits. For the first couple of months in to our Kanban journey, we started out with no measurement metrics like lead time charts or cumulative flow charts. This basically means we threw out over half of the benefits Kanban offers for us. We’ve missed out opportunities to learn ways the team could do to improve. I definitely wouldn’t suggest focusing overly on measurements right at the start when the system is new to the team. But we’ll need the team to move on from some stable point of time and re-think how we can assess performance and work on improvements. For our team, we started introducing measurement metrics 3 months into using the Kanban system. It was when the team felt we’ve understood how our items flow through the board (and its columns) and that the flow was sufficiently stable for us to start measurements. So there we are! All these talk about improvements have inspired me to end this post with a quote from “The Toyota Way” by Jeffery Liker: “Kanban is something you strive to get rid of, not to be proud of.” A Kanban system is by no means an end to any team’s improvement journey. It’s only one of the tools we can use to better see our team’s processes and its problems and eliminate obstacles by giving focus and direction. Don’t become the tool of our tools. If your team has also implemented Kanban and faced other problems in your Kanban journey, leave us your thoughts for discussion! This entry was posted in Software Development and tagged Improvement, Just-in-Time, Kanban on September 9, 2015 by Lorraine Lai.